Innovation is all around us. Innovation is in our cars. It’s is in our phones. It’s even in the coffee shops we visit for the free wifi. Companies like Tesla have shown us that innovation can take a startup from virtual obscurity to one of the world’s most admired brands in a matter of 5 years. Apple has proven that innovation can change the way humankind interacts with one another by breaking the paradigm of what a phone can do. Even Starbucks innovated the once mundane coffee shop into an entirely new experience where consumers don’t just come to buy a cup of coffee, they stay for the ambiance. And free wifi. Normally catering to startups, the Nashville Entrepreneur Center will teach 25 employees from Schneider Electric to think more like entrepreneurs. What these three companies have in common is that they’re all successful today because they’ve been thinking and acting like startups for years. Whether a new startup, like Tesla, or a 30 year multibillion dollar tech company like Apple, they’ve successfully embedded a culture of innovation into their everyday work. From the creation and launch of new offers, to how they make existing offers even better, they rely on innovation to thrive. Companies who don’t innovate, whether by ignorance or by choice, quickly find themselves in a very competitive and unforgiving commodity business. Schneider Electric is no different; we must innovate and continue to offer better products and services. In fact, our history and success is owed to innovations made in the past. For example, in the late 1800s when Schneider was a steel-maker (way before the word “Electric” was part of the Schneider name), we pioneered new ways to process steel, making it stronger and cheaper to produce. This new steel allowed us to make better machinery and infrastructure to meet the demanding growth of the industrial revolution. More than a century later, Schneider has transitioned out of steelmaking and into a global energy management and infrastructure company. One of the ways we’re innovating today is by learning to think like a startup. In partnership with the Nashville Entrepreneur Center in Nashville, Tennessee, Schneider Electric is sending employees from our EcoBusiness through an intensive two day course, called Jumpwerx. 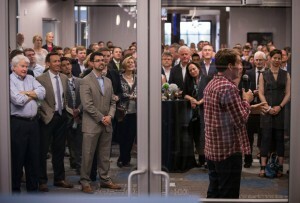 The program, a partnership between the Nashville Entrepreneur Center and Jumpstart Foundry, mimics the format of a startup accelerator, where employees from large companies, like Schneider Electric, will have two days to take a business idea from inception to completion, ending with a “pitch” to our executives. Think Shark Tank, minus the cameras, and Mark Cuban. The goal of the two day program isn’t necessarily to discover the next big idea, but rather to foster a culture of innovation within Schneider, empowering our employees to think and act beyond traditional offers and business models. After all, employees are Schneider’s most important asset, and when they’re encouraged to be more like entrepreneurs they can unleash innovation as game changing for customers as electric cars, smart phones, and even, coffee shops. The first 25 employees will go through Jumpwerx in early June. Stay tuned for a follow up post to learn how the program goes. In the mean time, check out the Nashville Entrepreneur Center’s blog post about the upcoming program. This is very interesting stuff!! When can we expect a follow up article? I would like to learn how this course changed the way we do things. Email me directly if possible.